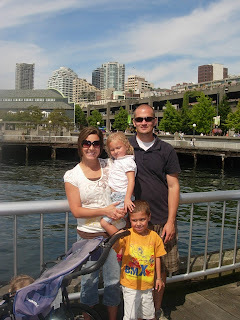 So, we took a weekend trip to seattle to check out some famulous sites. 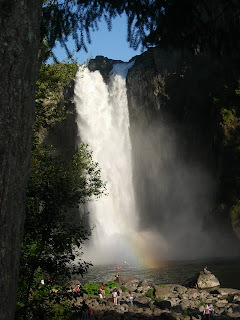 We decided to kick of our trip with a stop at Snoqualmie Falls ( who knows if i spelled that right) The falls were just beautiful. Conner is actually the one who convinced us to hike down to the bottom, whew! what a hike, carrying a baby! should have had a pack or something. The kids wanted to break the rules like so many other people were doing and climb the fence to go right down next to the water, but i figured "if" there happened to be a sudden change in the water rising, like stated on the warning posters everywhere not to climb the fence, we would be in trouble trying to get three small kids back over the fence, so i know, i know, had to hold back the wild side of me and stay put. I asked brandon if he would take a picture of me posing like ariel, on the little mermaid, ya know on the big rock? But he refused, so instead I snatched photos of the kids, neither of them wanted to play ariel though, sorry. 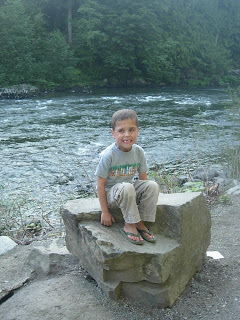 i love the outdoors, so green, mostly clean, and smells fresh, especially by the water. oh gotta love it when kids smile for the camera, someone's always gotta be a goof. So we were all pritty tired from our hike down, we only got about an eighth of the way back up the hill and no one could make it! So, being the responsible parents we try to be, we left the kids at the bottom with grandma and mary, and brandon and I hiked the way up. Oh how I was wishing I would have opted for the irresponsibility and sat at the bottom with everyone else! It was a big, long hike back up. people were looking at me funny cause I was sweating sooo bad. I'm sure they experienced the same moisture when they hiked back up too. decieving little sign, all it stated was steep incline! guess we weren't thinking of the way back, oh well, rest assured we made it and fetched our family from the bottom. 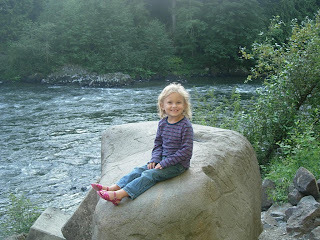 we made it to seattle that night and visited with family the rest of the evening. Saturday was the perfect day in Seattle! we couldn't have picked a better day, it didn't even rain!!!! We started off at fabulous pikes market, I just love walking around stuff like this, so entertaining, I'm a people watcher. 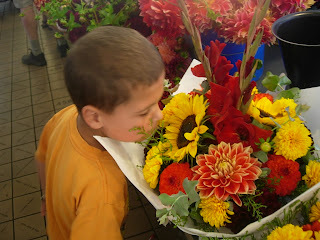 Caught this pic of Conner smelling the flowers for sale, so sweet. I wish I could have bought some they were just beautiful! 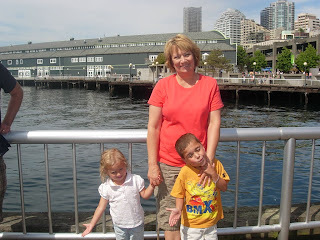 We rode the water taxi over to weast seattle and back, just like a ferry ride only, smaller boat, cheaper price, and shorter line, yeah for the bargain shopper! We walked all over, gosh I wonder how many calories I burned! 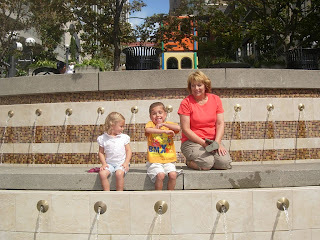 Conner and Taylor goofing off for their picture with grandma, typical. Don't ask me why we didn't atleast turn presley around, poor thing stuck in a stroller, in my defense, she was carried more than she rode! After walking till we couldn't we stopped to eat at a fabulous resteraunt on the pier. Several people recommended it so we decided to endulge. 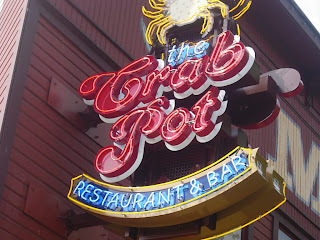 After the kids saw all the crabs inside in the display, they were begging for crab, so we got the famous crab pot, and yes they bring it in a pot and then dump it in the middle of your table! 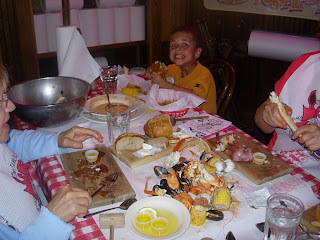 i ate a shrimp cocktail, yum and then i picked through the pot with the rest of them, exception to the boys, they ate burgers. 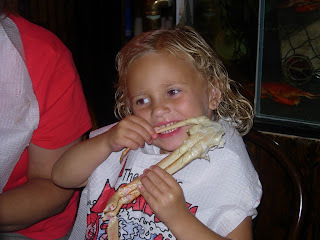 taylor actually really liked the crab, I thought she was brave. 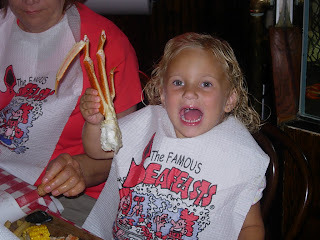 i think maybe she liked wearing the big bib more, but atleast she ate right? 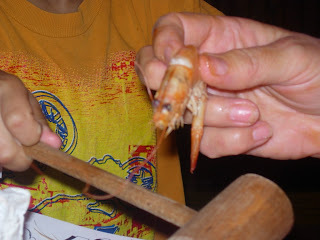 Conner was so funny, he made me take a picture of this shrimps eyes before he hit it with the mallot. Funnier was that grandma didn't know they were eyes till after she ate and conner pointed it out on this last one, funny. 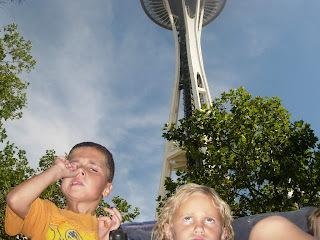 Well, after we were stuffed we cruised around some more and then rode the train to the space needle. We were going to ride up, but the tickets were 18 a person, and the line wound aroud for hours, so we just looked in the shops and enjoyed the weather. we did try to get a picture though, and i had to post it cause we were trying sooo hard to capture this and conner just had to pick his nose! 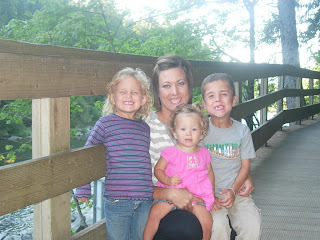 And poor taylor was just tired of pictures all together. Well the train broke down so we had to catch a city bus back to pikes market, conner thought the bus was the best of all, funny, who enjoys riding a stinky, packed city bus, evidently conner. After our 38 dollar parking garage bill, we decided to to call it a day, it was fun. Sunday it rained ALL day, we went to the locks and let the kids look at the boats, that was interesting, fun. then we cruised around looking at beautiful houses and such. 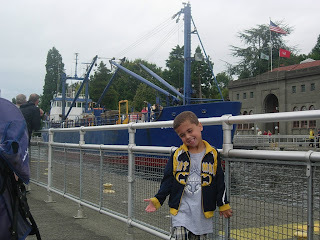 This was conner's favorite boat, it was a big one. 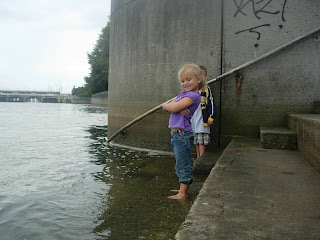 The kids played in the water, and the rain. all in all it was a great trip and i'm glad we went. geeze, this post is longer than the last one, that's what happens when ya slack on posting! sounds fun and makes me want to go back to Seattle! oh that looks like it was great fun! I've been trying to talk Mike into a trip to seattle. Plane tickets from Boise aren't too bad. I went as a kid and loved it. Maybe I can entice him with your pictures! You're kids are adorable by the way!